This looping animation depicts a south-southeast aspect as seen from the heart of the UK at 1am BST from 28 June to 1 July 2018. For scale, the view is about 80 degrees wide, or four times the span of an outstretched hand at arm’s length. Note that the Moon’s size is enlarged for clarity. AN animation by Ade Ashford. On Wednesday, 27 June 2018, Saturn reaches opposition in the constellation of Sagittarius. Earth makes its closest approach to the planet at 17:03 UT (6:03pm BST) that evening, at a distance of 9.048816 astronomical units, or 1,354 million kilometres (841 million miles). As oppositions go this is not particularly close, since Saturn was at aphelion – its farthest point from the Sun in its 29½-year-long orbit – in April of this year. Also, with a southerly declination exceeding 22 degrees, the planet will not rise any higher than 14 degrees in the southern sky of the central British Isles – that’s about one-and-a-half spans of a fist held at arm’s length. However, despite Saturn’s distance and low altitude as viewed from the UK, the planet’s oblate globe shines at magnitude zero and spans a respectable 18.4 arcseconds across the equator. 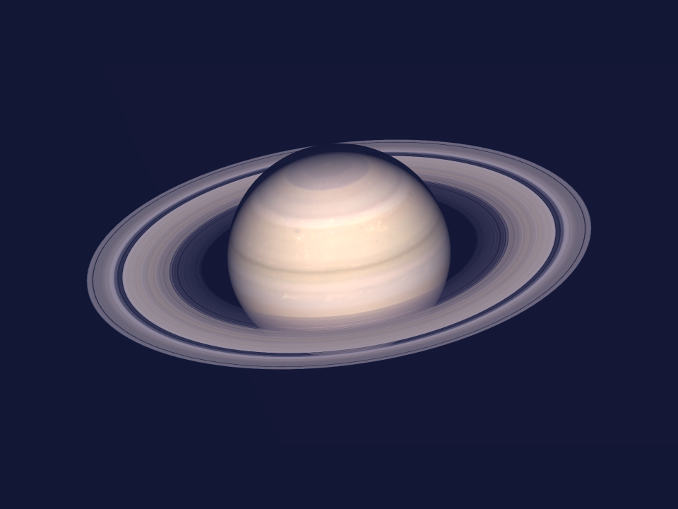 This means that during late June a telescope magnifying just 100× will enlarge Saturn’s disc to the same size as the Moon appears to the naked eye. Speaking of which, the almost full Moon lies just 3 degrees to the planet’s upper right late in the evening of 27 June. Saturn’s magnificent ring system is ideally presented this month. The plane of the rings (and the planet’s north pole) is tilted by 26 degrees towards our line of sight, so their elliptical outline measures 18.3 by 41.7 arcseconds at best. Good seeing and mid-sized backyard telescopes will reveal that the minor axis of the rings extends just beyond Saturn’s globe at the north and south poles. This is also an ideal time to see the so-called Cassini Division, the 3,000 mile-wide dark gap between the A and B rings. What’s the smallest telescope and magnification in which you can see this dark line in the ring system? Also, can you see the dusky, semi-transparent C ring inside that of the bright B ring as it crosses the face of Saturn? This computer simulation of the appearance of Saturn at opposition on 27 June 2018 shows that the planet’s north pole and the plane of its glorious ring system is tilted towards Earth by an angle of 26 degrees. The minor axis of the ring system extends just beyond Saturn’s globe at the north and south poles. Note the Cassini Division, the 3,000-mile-wide dark gap between the A and B rings, visible in small telescopes. AN illustration by Ade Ashford/Stellarium. Saturn is a gas giant that spins once on its axis in approximately 10¼ hours at the equator, but its thick gaseous atmosphere is somewhat bland compared to its larger sibling, Jupiter. Expect to see a subtle banded appearance in six-inch (15cm) aperture telescopes and larger (a light green filter may help differentiate its belts and zones), but you never know when a short-lived feature like the Great White Spot may reoccur. In common with Jupiter, Saturn has an impressive retinue of moons. The largest, 3,200-wile-wide Titan, orbits its parent planet every 16 days and is easy to spot in telescopes of 2-inch (5-cm) aperture or more as it shines at magnitude +8.5. Titan is at elongation, 4¼ ring diameters east of Saturn, on 15 June and 1 July. Titan can be found the same distance west of the planet on 23 June and 9 July. Second-largest Saturnian moon Rhea is also bright at magnitude +10 with a 4½-day orbit. Favourable elongations two ring diameters west of Saturn occur on the UK mornings of 16, 20 and 25 June. 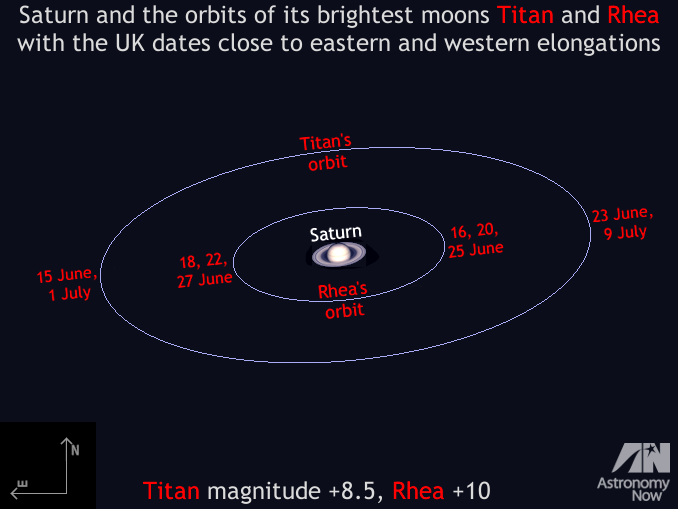 Rhea can be seen the same distance east of Saturn on 18, 22 and 27 June. The aspect of Saturn and the orbits of its brightest moons Titan and Rhea around opposition. Observers with Newtonian/Dobsonian telescopes should rotate this image through 180° to match their eyepiece view, while users of refractors and catadioptrics (Schmidt- and Maksutov-Cassegrains) with a star diagonal need to mirror this graphic left-right to replicate what they see through the eyepiece. AN graphic by Ade Ashford. There’s no denying that observing Saturn from the British Isles in June 2018 will be a challenge, but there are ways that you can mitigate shimmering high-magnification planetary views. Always ensure that telescopes have adequate time to cool down to the nighttime air (uncap reflectors to ventilate the tube) before making critical observations and try to avoid setting up on concrete or asphalt; grass is best. Also, try not to observe Saturn over the rooftops of houses where turbulent warm air currents rise. If at all possible, do try to view Saturn within an hour or so of the time it transits (see our interactive Almanac for local times) so that it is as high as possible above your southern horizon. While there is not much we can do about poor seeing arising in the atmosphere, those nights that are slightly misty when a high-pressure system sits above us often show the steadiest planetary views. Even if the seeing is otherwise good you will experience atmospheric dispersion when the planet is low in the sky, where the upper and lower limbs of the planet may appear to have prismatic blue and red fringing, respectively, due to our atmosphere acting like a weak lens. You may purchase an atmospheric dispersion filter to help counteract this, or simply a yellow/orange filter will lessen the coloured fringes. 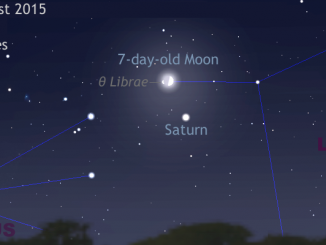 As dusk fades to dark on Saturday, 22 August, observers in the British Isles and Western Europe with clear skies can see the first quarter Moon close above planet Saturn low to the southwest. 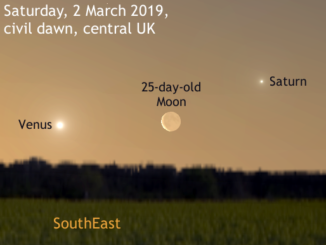 But for those skywatchers with binoculars and small telescopes, an additional treat is in store as the Moon passes in front of (occults) a naked-eye star. 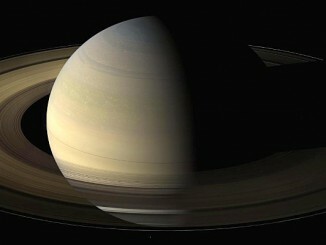 NASA’s Cassini mission scientists were watching closely when the Sun set on Saturn’s rings in August 2009. It was the equinox — one of two times in the Saturnian year when the Sun illuminates the planet’s enormous ring system edge-on — providing an extraordinary opportunity for the spacecraft to observe short-lived changes that reveal details about the nature of the rings.